Our thanks go out to everyone who made last Saturday's reading clubs such a success. Even though it was the first day of Spring Break, we had 916 kids, 419 volunteers, 76 parents, and 26 teachers and staff join us for a fun and meaningful morning of reading! If you weren't able to make it last Saturday, we hope you can join us for our May 10th "Fantasy, Folklore, and Fairytales" Reading Clubs! Please visit our website to sign up. Way back in 1999 we started with 20 children and eight volunteers, and now we average 876 children and 367 volunteers every month! 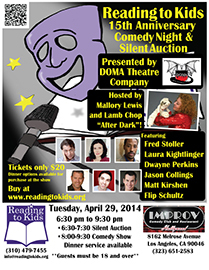 This hilarious evening will be hosted by Mallory Lewis and Lamb Chop! See the puppet you grew up watching as she helps us celebrate with some of her naughtier "After Dark" material! Joining Lamb Chop will be a handful of comedians hand-picked by the world famous Hollywood Improv. Across the greater Los Angeles area, schools are finding innovative ways to connect students to the natural world right on their campuses. On Saturday, April 26, 2014 from 10:00 a.m. to 4:00 p.m. all are invited to see this for themselves. The free Wildside Garden Tour 2014 is sure to give you ideas and hope. Highlights of the tour include Leo Politi Elementary, where Los Angeles Audubon Society's Leo Politi Education Program has become a national model for on-campus outdoor learning, and Walgrove Elementary School, where 25,000 square feet of asphalt have been removed and replaced with native habitat. You can visit the schools at your own pace for self-guided tours of their outdoor instructional spaces. What a great way to spend a Saturday! Thanks, and we hope to see you on April 29th at Comedy Night!